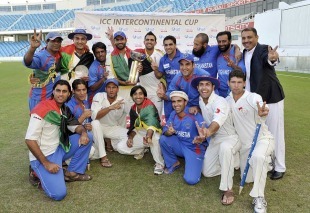 Just as the ICC Trophy, launched in 1979, was aimed at giving Associates a leg up onto the one-day stage, the Intercontinental Cup, which made its debut in 2004, was intended to give the leading Associates first-class exposure to the longer form of the game. The inaugural tournament was widely considered a success. Four three-country groups ensured that each side had a minimum of two qualifying matches. The toughest group by far was that featuring Scotland, Ireland and Holland - probably three of the strongest five teams in the competition - and Scotland, whose exposure to regular top-class cricket in the English National League showed - went through courtesy of their defeat of Ireland, who had already beaten Holland. The Americas group was won by Canada, and Kenya won Africa where Uganda sprung a major surprise by beating Namibia. In Asia, Nepal thrashed Malaysia but were pipped by UAE who gained more bonus points in their victory over the same opponents. Kenya, ripped apart by internal politics, fielded a reserve side in the semis and were thumped by Scotland while Canada saw off UAE. The final was unexpectedly one-sided as Canada were bowled out for 110 and 95 and lost by an innings to Scotland, who only managed 287 for 8 and were indebted to Gavin Hamilton's 115. In the second year the deficiencies of the bonus points system became all too clear, and sides who had matches rained off were placed at a major disadvantage. Holland and Scotland were always facing a mountain after their meeting was abandoned, and sides grew wise to the way to milk a flawed system. USA were thrown out of the competition by the ICC after a row with the USA Cricket Association, and Bermuda came through against a weakened Canadian side. Kenya, restored to full strength, won the Africa group while in Asia, UAE advanced to the last four on bonus points despite being routed by Nepal, whose game against Hong Kong had been blighted by rain. The finals were held in Namibia, and Ireland convincing outplayed UAE in a one-sided draw, while Kenya won through after a tighter draw against Bermuda, thanks largely to Steve Tikolo's 220. Both matches underlined the fact that three days was simply not enough. Kenya controlled the first two days of the final, Tikolo again to the fore with 177*, but an enterprising declaration by Ireland caught the Kenyans cold, and they collapsed in their second innings to set Ireland 245 to win. The Kenyan bowlers lacked any control and Ireland eased to a deserved six-wicket victory. Format Two groups of four, winners into final. A challenge match to decide the eighth place in the tournament. The mess with bonus points led to a rejig and a reduction in the number of teams, but the logistic need to bunch matches together meant that Canada were assured of a final place after two wins inside a fortnight while Namibia were eliminated within a fortnight of the competition's start. A rather disjointed competition ended with a final in Leicester which was over within two sessions as an unprepared Canadian side were skittled for 92 and Ireland raced to 202 for 0. An innings win was wrapped up within two days. Format A single round-robin league of eight teams, with each one playing seven games. The teams ranked first and second at the conclusion of the group stage, Ireland and Namibia, contested the final. Namibia topped the group stage and reland beat Kenya by an innings to reach their third successive Intercontinental Cup final. Ireland went on to become champions for the third consecutive time as they crushed Namibia by nine wickets in the final. Ireland also remained unbeaten in the competition, having won three successive do-or-die away matches against Namibia (twice) and Kenya to take the Cup. The format remained the same but there was controversy when UAE were dumped in favour of the inclusion of a Zimbabwe Select XI. Another example of unabashed politics from the ICC, it was entirely about restoring Zimbabwe's credibility at the expense of a genuine Associate. The exercise was put into perspective when Zimbabwe, never really interested in the event, gave Scotland a walkover in the final match after the all-too-familiar political issues of touring the country arose again. At least it spared the ICC the embarrassment of having a Full Member in the final of a competition for Associates. Afghanistan's easy win in the final against Scotland meant the cup went outside the UK for the first time, and few argued the best side - certainly in the group stages - won. Ireland, along with the Afghans the best of the Associates, missed out mainly because they failed to press home winning positions against Scotland and Kenya. Kenya's slide into mediocrity continued while Canada also took backward steps.